With more thrill ride experiences in the 707-horsepower Dodge Challenger and Charger SRT Hellcat models, additional celebrity showdown races and a larger than ever overall $40,000 purse, Motor Trend Group's "Roadkill Nights Powered by Dodge" will be bigger and better in 2018. For the fourth year overall and third year on historic Woodward Avenue, the popular street drag racing and car festival returns Saturday, Aug. 11 to take over M1 Concourse in Pontiac, Michigan, kicking off southeast Michigan's week-long celebration of classic cars and car culture. Spectator tickets, show 'n' shine participation and package information, as well as drag racing applications, are available now at roadkill.com/nights. Featuring two classes for drag racing this year, Big Tire and Small Tire, a cash purse of $30,000 is up for grabs. As part of the overall $40,000 purse, the largest cash purse ever offered at "Roadkill Nights Powered by Dodge," an additional $10,000 will be awarded to the celebrity showdown race winner's charity of choice. 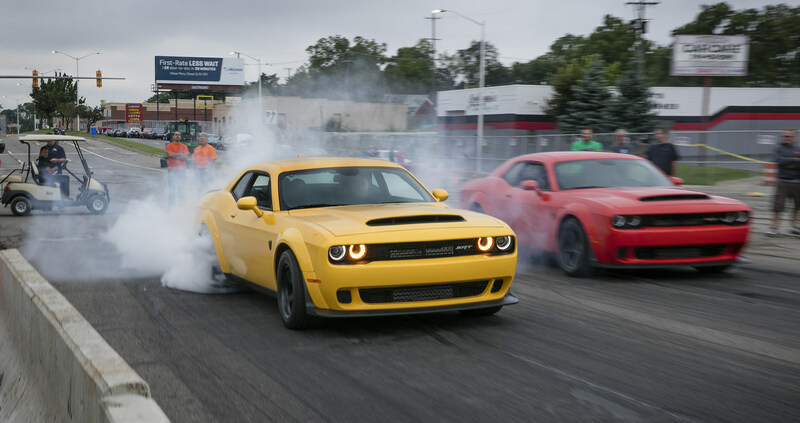 "Last year, more than 40,000 enthusiasts celebrated performance car culture at 'Roadkill Nights Powered by Dodge' in an epic kick off to a week of cruising events," said Steve Beahm, Head of Passenger Car Brands – Dodge//SRT, Chrysler, and FIAT, FCA - North America. "With drag racing, thrill rides and music, Roadkill Nights gets people on to a track run by professionals, so they can really show how their hot rods perform in a more controlled environment." There also will be more celebrities participating in showdown races and the addition of freestyle motocross exhibitions at the 2018 event. Leah Pritchett in her Dodge/Mopar Top Fuel Dragster and Matt Hagan in his Dodge Charger Funny Car will once again "light 'em up" on Woodard Avenue. Other returning fan favorites include the high-octane virtual head-to-head racing in Dodge Challenger SRT Demon simulators; show 'n' shine; dyno testing; "Roadkill" stunts; flamethrower and wheelstander exhibitions; family friendly kidszone activities; and an eclectic array of food truck offerings. The drag racing will include a celebrity showdown with Motor Trend's hugely popular series "Roadkill" co-hosts David Freiburger and Mike Finnegan. Chris Jacobs of Velocity's "Barrett-Jackson Live" will emcee the activities, while Brian Lohnes of Motor Trend's "Put Up or Shut Up" will emcee the drag races. Additional industry celebrity attendees include Richard Rawlings of Discovery's "Fast n' Loud," Steve Magnante of Velocity's "Barrett-Jackson Live," Cristy Lee of "Barrett-Jackson Live" and "All Girls Garage," and Bill Goldberg and Matt D'Andria from the automotive podcast "CarCast with Adam Carolla." "Roadkill Nights not only brings 'Roadkill' to life, but also allows our fans to appreciate firsthand the thrill of top-speed drag racing," Freiburger said. "Going four years strong, the event has something for everyone. Whether you're a drag racer, car enthusiast or looking for a fun day to spend with family, Roadkill Nights promises a dynamic experience." Gates are open for "Roadkill Nights Powered by Dodge" from 10 a.m. to 11 p.m., with Dodge Thrill Rides taking place from 10 a.m. to 10 p.m. and drag racing from 11 a.m. to 10 p.m.
General admission to the event is $10 per person — $5 per person for Pontiac residents ($5 price available on-site only). Children 12 years and under are free. Full details for spectator tickets, show 'n' shine registration, participant registration for drag racing, and an extensive range of packages are available now at roadkill.com/nights. Roadkill Nights is an event produced by ROADKILL, a brand of Motor Trend Group, with a hit show that delivers a one-of-a-kind taste of "Automotive Chaos Theory" on the Motor Trend App and Velocity network. For more information on Roadkill and Roadkill Nights, see Roadkill.com and follow on Facebook, facebook.com/roadkillshow, and Twitter, twitter.com/roadkillshow.